what library does my program needs? i know the library but where can i get it [or download it]? i have the library but how to add it into my program? Exception Description: Configuration error. Class [com.mysql.jdbc.Driver] not found. it’s caused by the missing of class javax.mail.Message, then “how to know the library [jar file] if i just know the required class?” simply open your browser and go to http://findjar.com/ to seach what jar file contains the class. download it. now you have the jar, so how to connect the library [jar file] to the program? there are two possibilities, your program written with IDE or NOT at all. select ‘Add JAR/Folder’ to find you JAR file. 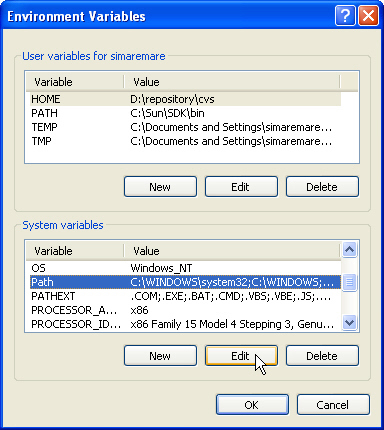 but if you don’t use any IDE, you have to link the JAR to the ‘Environtment Variables’, i will show how to add it in Windows operating system. finish. 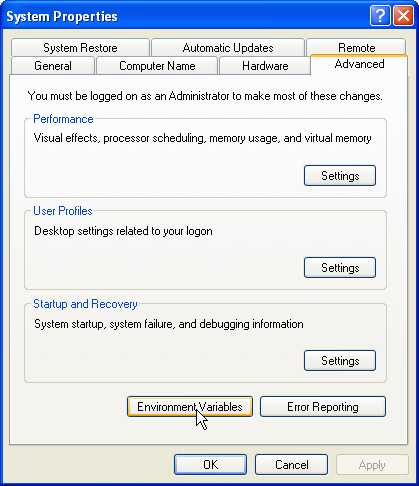 reopen your command prompt [if you use it]. the exception thrown because you miss the Mail API. to fix it up, just add the required Mail API. to fix it up, just add the required JDBC Driver. a year ago, i had a project which requires mail functionality. the most required function was to send email. then we decided to design a class which exploit Java Mail API to fulfill the requirement. to test it, write this code in your Main class then run it. in java programming, you can write or transmit your object over the network, how come? java provides an object serialization which ‘converts’ an object into a streaming bits, then you can do many things with the stream. “could you give me some example?”, okay, in this session i will show you how to serialize objects and deserialize it back. one thing you have to remember is when you want to make a serializable class, make sure that you ‘flag’ it by implements java.io.Serializable interface. 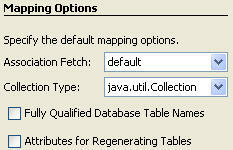 well, in this section you will try to update and remove a record in a database through Java Persistence API. hum,… this part is a continued part of the provious section actually, so you need to do the previous [about record insertion] before continuing to this one. 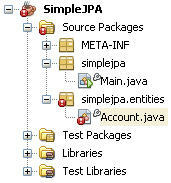 updating and removing record by using JPA is so easy. in this session you just need to modify two classes that we have made before [in the previous part]. now, we will practice a simple action by using Java Persistence API to interact between a simple application and it’s database. 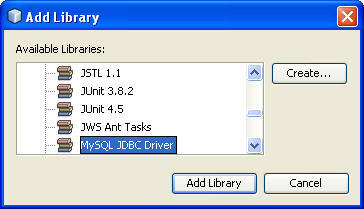 MySQL database, JDK 1.6 update 10 and NetBeans 6.5 as IDE. 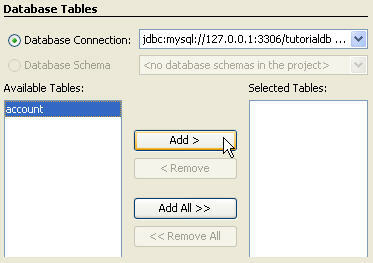 ok, i think there is no problem in database and table creation. now we go to the java code. 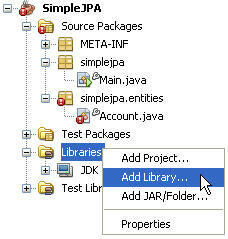 open your NetBeans [i use NetBeans 6.5] and create a new project, name it as ‘SimpleJPA’. now we just need to ‘convert’ all tables into classes. how? by right clicking on the project, select ‘New’ > ‘Entity Classes from Database…’. 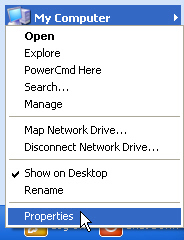 if you have no database connection, just create a new one by choosing ‘New Database Connection’. fill all required fields, make sure that you fill all of them. you can specified the package for this entity [and it’s recommended]. after the entity generated, you’ll see some missing libraries, to fix it, you just need to add TopLink and MySQL Connector, don’t worry NetBeans provide all of them. you just need to link it to them. how? right clicking on the project’s Libraries > Add Library. 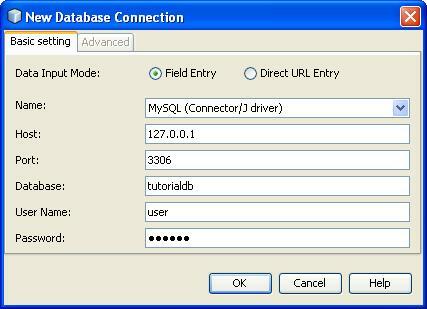 select TopLink Essential and MySQL JDBC Driver. the next step is creating a persistence unit, it’s a part of Java Persistence API, which act as the administrator of connectivity, and maintain the entity life cycle. to create a persistence unit, right clicking on the project > ‘New’ > ‘Persistence Unit’. 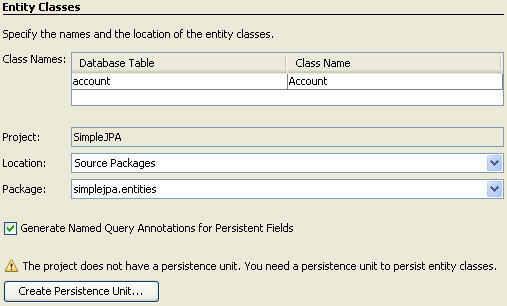 then fill the persistence unit’s name, set the driver with TopLink [default] and select the database connection. finish. now you have a managed type of entity. hmm,… do we have all? actually, yes, but i would prefer to create a manager class which will simplify us [as the programmer] to interact with the entity object, just call it as ‘Database Manager’.